Welcome to IRSCL Congress 2017! 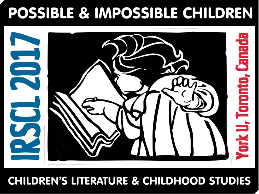 The Congress theme is “Possible & Impossible Children: Intersections of Children’s Literature & Childhood Studies." York University acknowledges its presence on the traditional territory of many Indigenous Nations. The area known as Tkaronto has been care taken by the Anishinabek Nation, the Haudenosaunee Confederacy, the Wendat, and the Métis. It is now home to many Indigenous peoples. We acknowledge the current treaty holders and the Mississaugas of the New Credit First Nation. This territory is subject of the Dish With One Spoon Wampum Belt Covenant, an agreement to peaceably share and care for the Great Lakes region. Pond Road Residence is located at 92 The Pond Road, Keele Campus, York University, 4700 Keele Street, Toronto. It is Building # 35 on the York University Keele Campus map. Executive Learning Centre (the on-campus hotel) is located at 56 Fine Arts Road, Keele Campus, York University, 4700 Keele Street, Toronto. It is Building # 94 on the York University Keele Campus map. Registration will be held in Gales Gallery, Accolade West (ACW), Building # 93 on the York University Keele Campus map. Pay Parking in a nearby covered parking garage is available for visitors at the Student Services Parking Garage, Building # 84 on the York University Keele Campus map. York University Keele Campus maps will be available in delegates' bags, but can be accessed at any time. Please e-mail us at irscl17@yorku.ca with any questions. We look forward to having you join us in Toronto, Canada, at York University, in 2017, for IRSCL CONGRESS 2017!